Nazmiyal and Hearst Designer Visions – Nazmiyal Collection is pleased to announce their partnership with Hearst’s Designer Visions 2012. Four of Nazmiyal’s rugs were featured in the sixth annual showcase, and are now on sale through an exclusive online storefront. Nazmiyal has also donated a mid-century Moroccan rug to the Designer Visions charity auction benefiting the hurricane Sandy relief in New York City. The auction launched today and runs until February 26th. The Designer Visions 2012 showcase puts the spotlight on the best in interior design talent and trends. Featured designer David Rockwell chose a selection of antique rugs from Nazmiyal in the House Beautiful apartment, including a spectacular Oushak. The Oushak rug and other antique carpets and vintage rugs from and inspired by the showcase are now available for purchase exclusively from the online marketplace Dering Hall. This is the first time accessories from the apartments have been made available to collectors worldwide. “Naturally a lot of time and effort went into putting these rooms together, and the result is breathtaking. To harmonize it all together with the online storefront makes it a package deal for anyone interested in the layout and furniture,” says Nazmiyal. 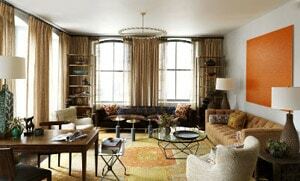 The Designer Visions showcase is located in the El Ad Group’s landmark residential property in Tribeca, one of the areas hit by Hurricane Sandy. To aid the Mayor’s Fund to Advance New York City’s hurricane relief efforts, Charity Buzz has launched an online auction of Designer Visions-inspired items and experiences. 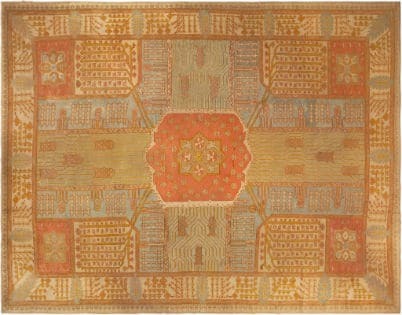 To support rebuilding their hometown, Nazmiyal has donated a mid-century modern Moroccan rug to the auction. Bids are being accepted from today until February 26th.